Mistimed lights causing problems on south side Indy. 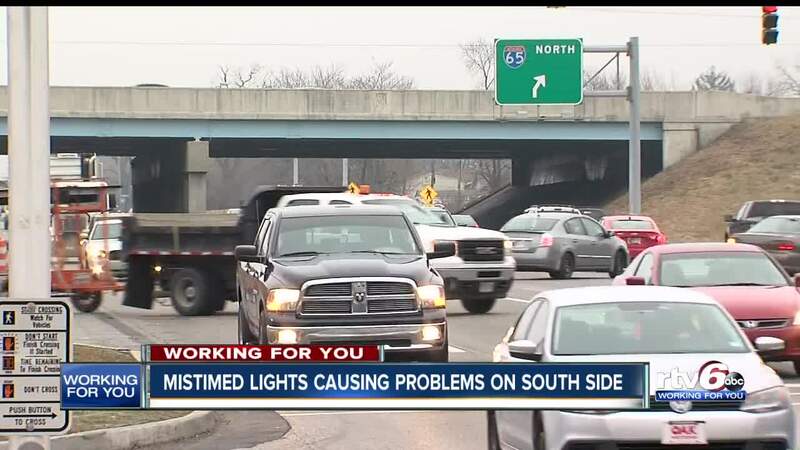 INDIANAPOLIS — Folks on the south side of Indianapolis are upset about the mistimed lights off of an I-65 ramp. Leaving drivers in long waits and cars backed up. At Raymond Street you can see the light is green, but no one can get through because the light at Shelby Street is red at the same time. South side drivers say this has been a problem for years. RTV6 found out why. The problem deals with two traffic light - and two different transportation agencies. The traffic light that greets drivers as they exit southbound I-65 is the Indiana Department of Transportation (INDOT), while the light immediately to the the west is the Department of Public Works. RTV6 reached out to DPW and INDOT. A spokeswoman from DPW says they have worked with INDOT for years to the signals synced - saying when lights are that close, it can be difficult. The DPW spokeswoman said the best way to solve the problem would be to have a technician from DPW and INDOT on site at the same time. INDOT is sending a traffic technician out on Thursday morning to make sure there is no equipment malfunction. RTV6 will follow up with updates.